It not only inspired a movie called Session 9, but is well known for its hair-raising haunted stories. 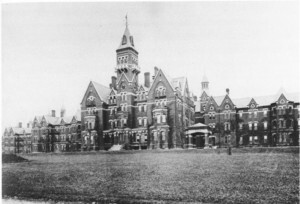 The Danvers State Insane Asylum opened up in 1878 in order to help accommodate mentally ill patients, as other hospitals were overflowing. It was placed under the supervision of Nathaniel J. Bradlee; he was also the architect of the building. From 1841 to 1883, Thomas Kirkbride was a devoted superintendent. He believed putting the patients in a “humane and compassionate environment” would bring them to their natural state. 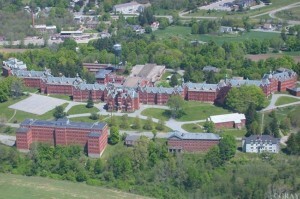 Kirkbride, by the end of his career, was known for the Kirk Plan, which inspired almost every American State Hospital. Although with good intentions, the hospital’s patients decreased and budgets were cut causing it to close. There were many rumors of experiments of mistreatment, torture, and lack of staff to give the proper needs to patients. Looking back into history, interestingly enough it was built on Hathorne Hill, where the Salem Witch Trials judge, John Hathorne, once lived. It was eventually bought and the owner created the place into apartments. People complained about the conditions of the building, but it still stands. Due to its rough history and ghost appearances it has influenced many movies and books today.